Enjoy - Food & Travel: Completely corked - or deviate taste? My friend, Hans Kristiansen, brought this very exclusive wine produced at the Château de Meursault estate in Burgundy, for the dinner yesterday. He told the staff in the wine-store that he needed a wine to match a pungent Cajun/Southern pork dish, and was recommended this one. And he paid up, NOK 237, close to €30! I have had wines from Burgundy earlier, and many of them need to develop for a long time. The personell told, however that this wine was ripe for consumption. It matched the pork alright, but not in the way you think. 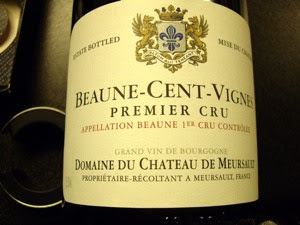 Beaune-Cent-Vignes, Premier cru 2004 is made from 100% pinot noir, and decribed as "medium violet red colour, young fruityness from strawberries and raspberries, hint of oak." When we opened and tasted the wine, however, it had a strong and peppery character and a very bitter aftertaste. As Hans' partner, Frode Grøstad arrived, he suggested that the wine had to be corked. Since none of us had tasted any corked wine, previously, we decided to bring the wine back to the wine store. The staff gave us a lesson on the characteristic tastes and bouquet of corked wine. They described the bouquet of a corked wine as "damp cardboard, or damp moulded basement." They did, however, conclude that the wine had a deviating character and registered the case into their database. A pity, really, as I would have loved to taste this wine! The good thing was that he got two bottles of Allesverloren Cabernet-Sauvignon 2004, and he gave me one as a compensation for the other bottle! The personell highly recommended this wine as one of the best in their selection. I will give you feedback when I drink it. I wonder if you have heard about Priorat red wines. Priorat is a really good wine area in south Catalonia. I know it's not as famous as Rioja but there are some really good wines. You should try if you can find it in Norway.